What’s that you say? You need more Batman Pops? Well apparently it is your lucky day because Entertainment Earth just announced their exclusive 75th Anniversary Yellow Rainbow Batman Funko Pop! Vinyl Figure (try saying that fast ten times in a row) that will be released in March. You can pre-order it now for $12.99 plus shipping. UPDATE: There will be five other coloured rainbow Batman Pops coming to EE in the near future. We’ve heard some cases of collectors successfully asking customer service reps to reserve the whole set of six, so give that a shot! Will you be adding this to your want list? Just click the image to take you to the item page. Harley Quinn Roller Derby & Harley Quinn w/ Mallet Available at Popcultcha! Really taxing the batman fanatics among us. So many to collect. Yes, if you notice on the site, it says there will be 6..yes, 6 of these rainbow batman Funko pop’s! 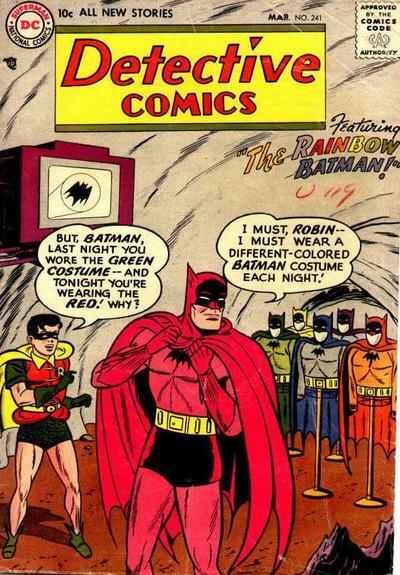 Detective Comics Volume 1 #241…The Rainbow Batman! Very welcome!! ALso, the pre-ordering of all 6 variants at once can be done by calling the EE customer service; successfully did this myself! If you call into EE at 800-370-2320 you can pre order all 6 variants at once. I am hoping they save some protos for giveaways at Funko Funday 2015. Aaaannd…right away it’s available for pre-order at Popcultcha. Ordered… can’t order all 6 at once but will do one at a time as they are made available online.